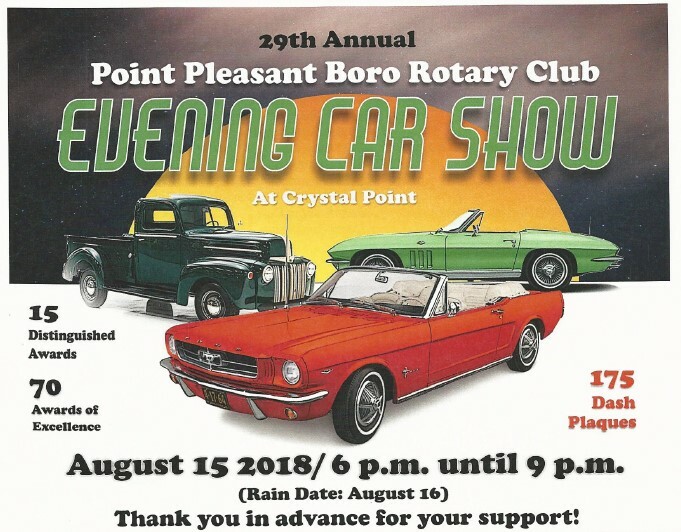 The Point Pleasant Boro Rotary Club will host the 29th Annual Car Show at Crystal Point Yacht Club 3900 River Road, Point Pleasant N.J. 08742 (On the corner of Route 70 and River Road). The show will be held on August 15th (rain date 8/16) from 6pm until 9pm. 85 Trophies will be given out at 8:30pm. Music will be provided by Wolf Man Jerry. Dash plaques will be given to the first 175 cars to register for the show. The show will feature Antique Cars and trucks, Modified cars and trucks, Foreign, Custom, Street Rods, and replicars. Pre-registration before the show will be $15.00 per car. Registration on the day of the show will be $20.00. We are asking your assistance in making our 29th Annual Event Car Show a Huge a success! How can you assist? Monetary contribution for the TROPHY AWARDS. The donations will help offset some of our expenses. Keep in mind that profits from the Car Show go to Rotary scholarship for Point Pleasant students, the DARE program, and other charities through the Point Pleasant Bror community. Your donations go to the STARS OF THE SHOW, our particpants, who have some of the finest show cars and trucks in the tri-state area. Last year we had almost 300 Display Cars and over 2,000 spectators. All donors are given credit for their donations. Both at the car show and in the Coast Star and Ocean Star Newspapers the week after the show.